Some time back I discovered Lucille had old hats in her attic carefully tucked into hat boxes. 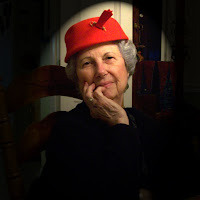 She said she wore hats back in the late 40's, early 50's but ended up storing them away because the ladies quit wearing them. She said I could have them. So, when Beau & I went to pickup the crib last week, we brought the hats home. Interesting that the boxes themselves crumbled when we picked them up, but the hats inside are in perfect condition. Tonight, after dinner, and two glasses of wine, we got her to model a couple of them for us. Unfortunately (for me), the hats are size 22, which is a bit snug for me. I'm hoping that I might be able to take a pattern off a couple of them.